Daikin is the world’s largest manufacturer of heating and cooling systems! 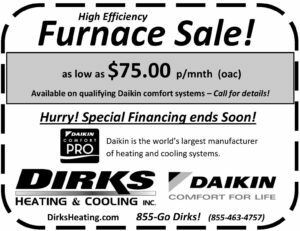 And Dirks Heating and Cooling Inc. is proud to represent the complete line of Daikin furnaces, air conditioners and heat pumps. 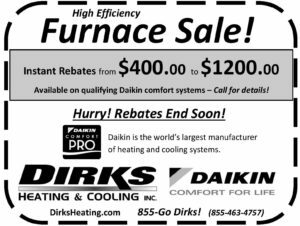 With cold winter on the way, there is no better time to install a new Daikin High-Efficiency Furnace to comfort your home and start saving on energy bills. Whether you want big savings with great rebates, or low payments to fit your budget, Dirks Heating and Cooling has a high-efficiency system with financing to meet your needs. Call TODAY to schedule your no-obligation estimate with one of our Comfort Specialists!